In the first post we learnt about the pitfalls of P/E ratios and the limitations of using discounted cash flows. Buffett owners earnings fixed most of the shortcomings. In the second post we learnt about valuing a company using residual earnings method. But residual earnings has few limitations. One of them is that return on equity (ROE) can be increased by leverage and this in turn increases residual earnings. In this post we will address this limitation. 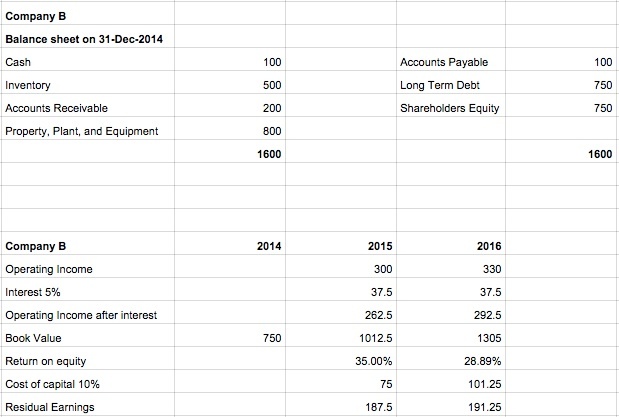 Given below is the balance sheet and income statement of Company A which I made up. The company does not have any long term debt and it has a positive and constant residual earnings. Also let us assume that A has only one share outstanding. What is the intrinsic value of A? 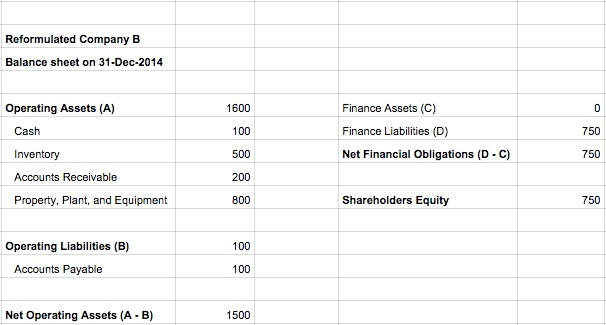 Now take a look at the balance sheet and income statement of Company B. You can clearly see that A and B have the same net operating assets, sales, and operating margins. The only difference is that B has a long term debt of $750 at 5% interest. Also let us assume that B has only one share outstanding. What is the intrinsic value of B? Leverage increases return on equity, earnings per share, earnings growth, and indeed residual earnings, but it is very doubtful that it adds value: Beware of earnings created by leverage. Borrowing does not add value. In the example, this principle simply says that, if the firm borrows at a fair market value and repurchases stock at fair market value, it cannot add value to its stock price. Financing transactions at fair market prices are zero-net-present-value transactions; a firm adds value in its business from trading with customers, not from buying and selling bonds and shares at fair market value. Every company is involved in operating and financing activities. Operating activities involves dealing with customers and suppliers. Financing activities involves trading in the capital markets. The picture given below clearly shows the difference between these two activities. A firm adds value only from trading with customers and suppliers and not by trading in the capital markets at fair market prices. Hence as an investor we should value the operating activities of the firm separately and exclude the effects of financing activities. 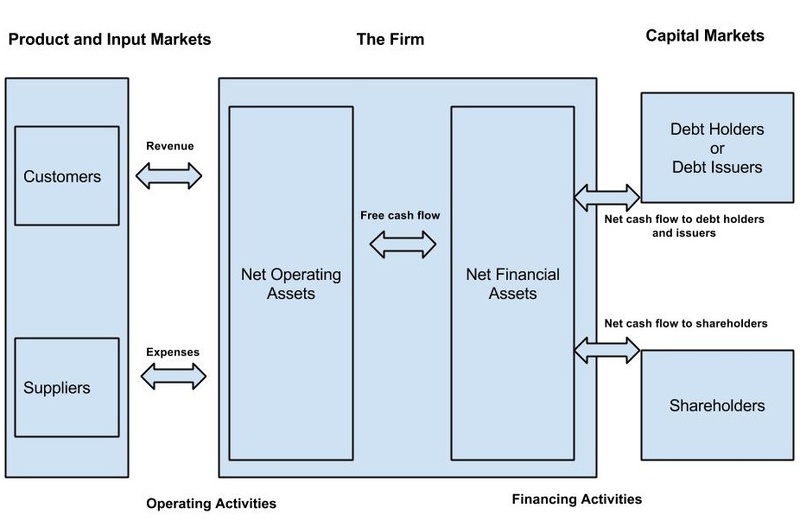 In order to do this we need to reformulate the balance sheet and income statement by dividing the firms operating and financing activities. 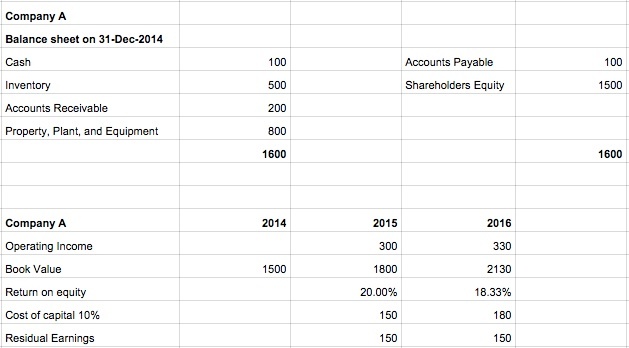 Take a look at B’s reformulated balance sheet. You will notice that I have grouped its operating activities on one side and financing activities on the other side. Also I have assumed that $100 in cash is used in operating activities. From this I have come up with three key formulas. Make sure understand them deeply instead of blindly memorizing them. To calculate the intrinsic value of B we need to value only its net operating assets. In order to do that we need to reformulate its income statement by removing the effects of interest. To keep the calculation simple I have assumed that B does not owe any taxes. Value of B’s net operating assets comes to $3000 and it is same as the intrinsic value of A. This should not surprise you as the net operating assets, sales, and operating margins of A and B are the same. Now the final step is to remove the effects of debt to arrive at the intrinsic value of B. The intrinsic value of B is $2250. This valuation is 16% lesser than our initial valuation of $2625. By valuing the net operating assets of B separately we have fixed the effects of leverage. Also I did not reformulate the balance sheet and income statement of A. Why is that? A’s net operating assets is fully funded by its equity and its net financial assets is zero. Hence its ROE and RNOA will be the same resulting in the same intrinsic value. 3. Is there a relationship between RNOA and ROE? There is a deep relationship between RNOA and ROE. Its very important to understand as this shows the key drivers of profitability in the business. Company B’s ROE comes to 35% and I am going to prove that ROE contains RNOA of 20% and the remaining 15% comes from the financial leverage. ROE = RNOA + (NFO / CSE) * [RNOA - NBC] -- Click on the image given below for the proof. 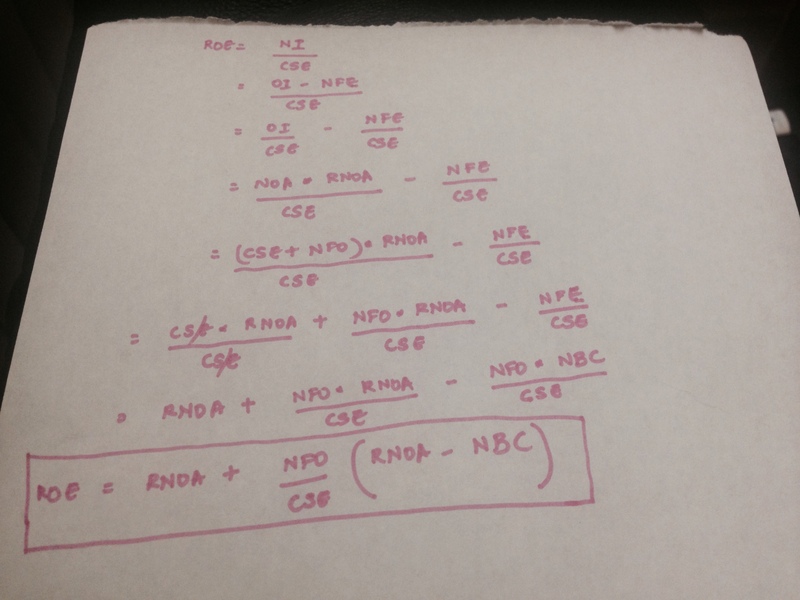 Company A’s ROE and RNOA comes to 20% and the formula clearly shows how. ROE = RNOA + (NFO / CSE) * [RNOA - NBC] -- Click on the image given above for the proof. We have come to the end of this post. But we are not done yet. There are couple of items that I still need to cover (1) Accrual earnings can be fudged (2) Expenses like Advertising and R & D can create durable competitive advantage and they should not be expensed fully but instead kept it in the balance sheet and amortized over time. I do not have enough knowledge on these items and hence I am not qualified to write about them. I am planning to read the following books to improve my knowledge. Maybe sometime in future I will write about them. Very good insights Jana! Will need to internalize it. Good stuff. I cannot understand why intrinsic value is a sum of both book value and earning power – I thought it was either of – you either look at a company as an asset or as an earning machine. Could you please explain why ? Varadha, you are right. However, if you’ll look closely you’ll see that Jana indeed used the book value in his calculation, but he didn’t use the whole ‘earnings’ figure; instead he properly used the residual earnings figure, which is the ‘excess’ earnings power of the business over the earnings power already reflected in the book value. Jana, very nice post. Very informative. One thing I think you should have mentioned more clearly is the puzzling gap between the equity values you’ve found by using the 2 different methods of calculation (1. net income residual earnings; 2. net operating residual income). The answer to this conundrum is of course the different required rates of return you should have used. The reason for that is the dissimilar risk attributed to each method of calculation. The 1st net income residual earnings method should be discounted by a higher rate since it takes into account the cost of debt, which means it’s a leveraged earnings figure, and leverage is risky. In the same way, the 2nd method calculates the equity value by figuring the value of the whole enterprise without attention to debt, as if it had no debt at all. The easiest way to understand your own required rate of return from the whole enterprise (or the unleveraged business if you will) is to compare the 2 equations of equity value which of course should be equal (it’s the same equity value of the same business). Thanks for valuable comments. Yes you are right and Penmann tackled this by using WACC at 15%. But for me reformulating the balance sheet and subtracting debt is much clear and clean. Yes, I do the same – valuing the business as an unleveraged entity and then subtract net debt. I think it’s much more clear and transparent for the investor to understand his basic requirements of the fundamental (operating) business. My comment above was just for the clarification that even with your hypothetical example, one of your valuations (be it the 1st or the 2nd) must be wrong, unless they aren’t referring to the same business (which they are). I know you know it, and made it this way because the easier way of calculating with a 10% required rate of return, but I figured that some readers will be left perplexed.. Thanks a lot. Do you have a blog. If yes can you share it? Unfortunately no, I seldom comment in blogs and forums but not more than that. Seems like a lot of work. That’s why I respect other investors who write and help educate others, just like you. So keep up the excellent work! I do manage investments, and I’d be happy to discuss ideas and such with you, if you like. Thanks Ravi. Looking forward to enjoy that book. I will do a post once I learnt it deeply. Great post eager to see your interepetation of earnings that count! Thanks a lot for sharing your post on earnings that count. I will take a look. Reblogged this on Random thoughts of an Insecure Investor. Wow wonderful post. Yet to read the part 4. I have read 3 parts atleast 2 to 3 times each. Thanks for such wonderful writeup. Thanks for explaning the concept very clearly. If a company has a lot of long term debt, would it be wise to add it back to the book value and use that in our calculation ( in place of published BPS) ? This way we can evaluate the company as a non-leveraged entity and deduct the long term debt at the end to calculate intrinsic value. Debt creates financial leverage and this in turn increases return on equity. In order to remove the effects of financial leverage, I took operating income so that I can compare both A and B. In the previous post I was focusing on explaining the residual earnings concept and hence I used net income. In this post my focus was to show the effects of leverage and hence I used operating income. 2. For adjustments, we are trying to add debt part (net financial obligations) to company B’s operating assets. I am not sure if I follow this. Should not this be subtracted? 3. ROE for B got bumped up due to lower Book value which is cause of debt. Hence, this tells me that ROE should be looked along with debt to equity. Thanks for writing this blog. It helps..